Wouldn’t it be nice to give something especially Irish this Christmas? Not only would you be supporting Ireland’s economic recovery if you have a mind to, but also lots of jobs that keep those rural communities we are all so fond of as tourists alive and awake! But most importantly you or your loved ones would be receiving a quality gift that will be appreciated and valued for its uniquely Irish appeal. Like Waterford Crystal, who wouldn’t be pleased to ring in 2012 with a couple of crystal champagne flutes? The first edition Partridge in a Pear Tree from Waterford Crystals 12 Days of Christmas Range are reduced by 70% at www.giftshopireland.com while stocks last, they are fast becoming modern day collectibles. 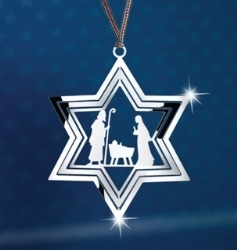 Just like their cut glass tree ornaments and baubles which make the perfect one size fits all gifts, from new babies, to birthdays and anniversaries and even hostess gifts this time of year. Gift Shop Ireland has the widest selection of Waterford Crystal in the world, as well as an exclusive on Nicholas Mosse pottery. Plus they are offering a 10% discount and free shipping worldwide for all Irish Central readers, simply enter the code Christmas Gifts at point of purchase. Or if you would prefer to let the recipient, especially us ladies, do the choosing you can’t go wrong with a gift card from Brown Thomas, pretty please? Following on from the success of the Marvel room last year, Brown Thomas has pop-up Gift Box shops in all of its branches throughout Ireland to excite and delight shoppers this Christmas. Packed full of even more covetable and collectible designer goodies, believe me a gift card from Brown Thomas is as they say themselves, is the one gift that is sure to please all of the people, all of the time! Available online from www.brownthomas.com in whatever value you wish, simply add your personalised greeting and you wont see us for fairy dust…. Finally, why not send an edible feast to your loved ones here or at home. The Burren Smokehouse pack the finest hampers with the very best Irish food and drink from carefully selected Artisan producers throughout Ireland, alongside their own award winning organic Atlantic smoked salmon, which was fit for a Queen, Elizabeth II no less, when she was here last May. 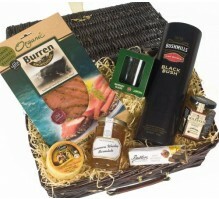 They have a huge range online from the small artisan baskets at €59 to full on banquets for €299, although the best selling baskets are the Whiskey Basket at €99, everything in it from the cheese to the marmalade and chocolates are laced with whiskey to the Clare Basket €89, all of the produce comes from County Clare, you can almost smell the Burren! But you would need to order from www.burrensmokehouse.ie before the 9th of December to guarantee pre-Christmas delivery. If you do decide to buy Irish this Christmas and I hope that you will, thank you for supporting Irish jobs, Irish businesses and communities throughout Ireland.